Downy woodpeckers are resident birds and do NOT migrate. The Downy Woodpecker is a Cavity Nesting Bird. Being woodpeckers they can excavate their own cavities but they will reportedly use nest boxes. I haven't had them nest in a nest box but have them regularly roost in nest boxes. Downy woodpeckers are well adapted to yards with scattered trees. They are a bird of forests and woodlands and they do much of their feeding on trees. They are an abundant woodpecker and often found at bird feeders. You may entice them to nest in your yard if you leave dead branches in trees. 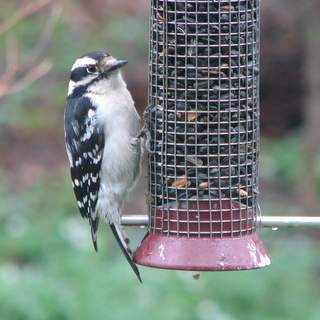 Downy woodpeckers love black oil sunflower seeds. Black oil sunflowers really are one of the best seeds for the most kinds of birds. I feed black oil sunflower seeds in a wire peanut feeder, hopper feeder, and a hanging platform feeder. Downy woodpeckers will come to all three types of feeders but probably prefer clinging to the wire peanut feeder as it is similar to their natural feeding technique of clinging to a tree branch. They will also eat homemade suet. It is made with animal fat, peanut butter, oatmeal, cornmeal and wheat flour. I serve it in a hanging suet log. Use my recipe for making Homemade Suet and you will be sure to get lots of birds that relish it. Downy woodpeckers can nest in any dead branch that is about 4 inches or more in diameter. They tend to like trees that have soft wood that is easily excavated. Woodpeckers don't just need the trees for nesting, but also for foraging for food for their hatchlings. It's important to provide native tree species in your landscape. Alien tree species do not support insects which the birds need to raise healthy young. Native tree species support hundreds of insect species that feed our native birds. Some trees that that downy woodpeckers prefer to nest in are the following. 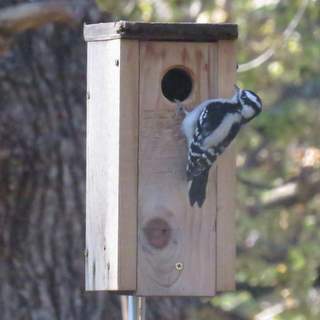 If you want to attract Downy woodpeckers to nest in your yard, put up a nest box. Find dimension, instructions and methods for building one at Nest Box Design. Recessed base: 3 1/2" x 4"
In 2018, I'm experimenting with a smaller inside dimension nest box for downy woodpeckers. It has a similar construction except uses narrower boards. My thinking is that the downy will excavate the interior to widen it a bit and in the process decide to nest in the box. Recessed base: 2 1/2" x 2"
Nest Box Design gives detailed information on building this nest box as well as others. I'd suggest building more than one nest box as the extra nest boxes as the more nesting options you provide the better. Once your nest boxes are built, you need to mount them. The mounting method is as important as the nest box itself. The method of mounting the Downy nest box is as important as the design of the nest box. Mounting to a tree is not a good idea, as squirrels will be attracted to it as well as predators. Furthermore a nest box mounted on a tree is difficult to monitor. A much better technique is to mount the box to a telescoping pole that attached to rebar. This allows the box to be located anywhere you can drive the rebar in the ground. It's important to locate the nest box in an area with a clear flight path to the box. The box is mounted to a 5' length of ½" conduit. Drill a hole through the conduit and the nest box so the box can be bolted to the conduit. The ½" conduit is mounted to a 5' length of ¾" conduit. A hole is drilled through both pieces of conduit with 12" of overlap. Drill the hole in the 1" conduit one inch from the top. Drill the hole in the ½" conduit 11" from the bottom. Combined they will have 12" of overlap and create a telescoping pole. A ¼" carriage bolt is used to secure the two pieces of conduit together. When the bolt is removed the top portion of the pole can be removed or lowered into the ¾" conduit.. The ¾" conduit can be attached to rebar driven in the ground or an existing wooden post. Learn more about the design and placement of Nest Boxes. The European Starling and House Sparrow are both invasive non-native species of birds that compete negatively with our native cavity nesting birds for nest sites. Neither species is protected in North America. Both can be trapped and eliminated. The House Sparrow can enter a 1 1/4" diameter hole. That is about the size of a down woodpecker hole. They will compete with downy woodpeckers as well as other native cavity nesting birds if they can enter the nest hole. House sparrows will enter a downy woodpecker nest hole and drive out the downy woodpeckers. One solution is trapping an eliminating house sparrows. Every year I have downy woodpeckers roost in nest boxes in the winter but they never nest in them. In 2017 I did have one start to peck on the inside of the box and it created a fair amount of saw dust on the bottom of the nest box. This box was a blue bird nest box with a 3 1/2" x 4" floor. I thought I should add some wood shavings to encourage it to excavate the box but that seemed to scare the woodpecker away. In 2018 I decided to create a nest box with a smaller interior size to encourage the downy to increase the size of the cavity by pecking away wood on the sides. This nest box has a 2 1/2" x 3" floor. I made the hole 1 1/8" diameter to keep house sparrows from entering. The downy woodpeckers like to widen holes so I'm hoping that will occur.